All information and pictures are culled from the two scrapbooks compiled by Robin between 1979 and 1981. Sorry about the quality ! After the extremely successful scam of the city area 5-a-side competition, then the city area 11-a-side competition, Robin needed something else to get time off from work. So City F.C. 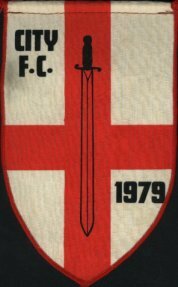 was formed in 1979 as a joke by Robin and Roger, the nucleus of the team comprised of men from BT Trunk Test in Faraday Buildings, London. The bulk of the team being TC. Once Robin got going on the phone to the BT City area sports & social association, he managed to secure sufficient funding to buy 2 sets of kit, plus all the ancillaries required to set up the team. 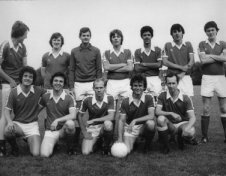 Much to their amazement, the team was accepted into the Beckenham Football League for the 79/80 season in Division 3. Only because there wasn't a Division 4. 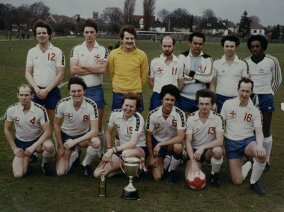 For good measure, the team was also entered for the Beckenham Hospital Cup, which wasn't presented to the worst foul, something that had to be explained to TC sometimes. So the scene was set for the best team since the one in "Escape To Victory" to take the field. A fetching combination of red shirts, white shorts and red socks for the home kit, White shirts, blue shorts and white socks for the away kit. The Admiral range supplied with a collar, just tight enough on some team members to look macho. But not on all of them. For the first season in the league, home games were played at either Cator Park or Churchfields, once the cows had been removed. Season two saw a move to Mottingham playing fields.